Roger and Jessica Rabbit are at a Hollywood movie premiere. The pin is in black and white. 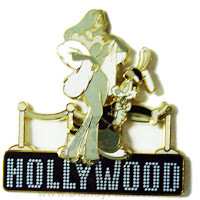 The "Hollywood" sign below them is printed on in white.